The Anatomy of Melancholy is a book by Robert Burton, first published in 1621. On its surface, the book is a medical textbook in which Burton applies his large and varied learning in the scholastic manner to the subject of melancholia (which includes what is now termed clinical depression). 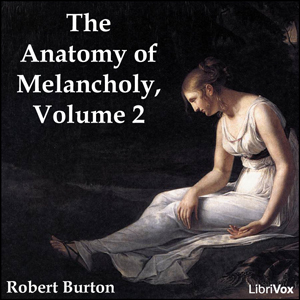 Though presented as a medical text, The Anatomy of Melancholy is as much a sui generis work of literature as it is a scientific or philosophical text, and Burton addresses far more than his stated subject. In fact, the Anatomy uses melancholy as the lens through which all human emotion and thought may be scrutinized, and virtually the entire contents of a 17th-century library are marshalled into service of this goal.